The Boyne Fishermen's Rescue and Recovery Service are a voluntary organisation based on the Marsh Road, Drogheda. Over the centuries it was a tradition of the Fishermen on the Boyne to give up fishing and concentrate solely on a search until missing colleagues were recovered. 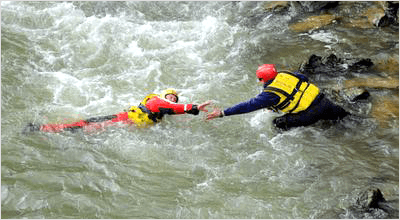 From this tradition evolved the modern day rescue service who are highly trained in a number of skills, such as Swiftwater Rescue, Diving, Power Boat Handling, Emergency Rescue Care, Oxygen therapy ect. The team undertakes many rescues along the Boyne throughout the year, resulting in many lives saved, in some cases the team will have to administer Emergency First Aid until the relevant authorities arrive. We also provide a search and recovery service, to people and communities who have lost loved ones through drowning tragedies on the rivers, lakes and sea around the 32 counties of Ireland. The mission statement of the Boyne Fishermen's Rescue and Recovery Service states that "If the Boyne Fishermen's Rescue and Recovery Service receive a call to anywhere in the 32 counties of the Island of Ireland, where possible the Boyne Fishermen's Rescue and Recovery Service will never refuse to attend, and where possible SHALL STAY until the missing person is returned to their family." We are proud to say that our mission statement has yet to be broken. The Boyne Fishermen's Rescue and Recovery Service is comprised of 30 volunteers who are on call 24 hours 365 Days a year. Volunteers are alerted through a VHF based paging system. Members of the Boyne Fishermen's Rescue and Recovery Service will be supporting the Irish Heart Foundation today. The Boyne Fishermen's Rescue and Recovery Service provides a 24 hour emergency rescue service along the River Boyne, 365 days a year. Search & recovery services are also provided to people who have lost loved ones throughout the waterways in the Island of Ireland. So why donate ? donate because your money helps us to provide a service that not just saves lifes but brings closure to families who have lost a loved one in our waterways. 01.14 am on Sunday 11th November the Boyne Fishermen’s Rescue and Recovery Service emergency paging system was activated to the reports of a missing persons in the Drogheda area and maybe attempting to enter the river Boyne. At 21.17 pm on Saturday evening,The Boyne Fishermen’s Rescue and Recovery Service emergency paging system was activated requesting all pager to report to the boathouse.